jewelry inspired by pieces of the past. Labradorite on Sterling Silver Chain Necklace. 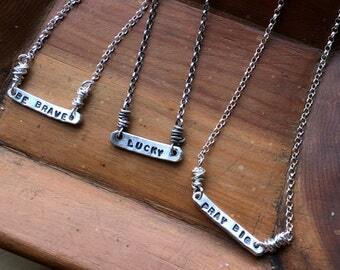 Simply Lovely Necklace. Mixed Metals Watch Chain Sterling Silver Protection Necklace. Victorian Pocket Knife Fob Necklace. Announcement Thanks for stopping by! I'm Mona Lindvall. At mLindvall, I create one-of-a-kind and some-of-a-kind jewelry inspired by pieces of the past, by combining new and aged pieces and parts. My work is sometimes rustic, sometimes refined or a combination of both! 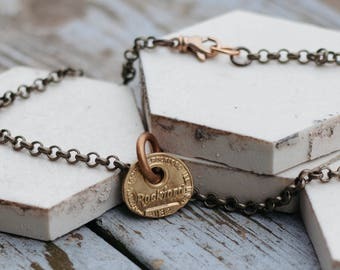 By incorporating organic materials, found objects and semiprecious stones with sterling silver, copper or brass, my pieces come to life as upcycled, inspired and meaningful designs. My focus is on creating art that serves as amulets or talismans, pieces that honor relationships or events, or those that serve as protection---out of the ordinary jewelry that often revives mementos from past lives. Should you choose a piece of jewelry from mLindvall, my hope is that you'll enjoy it for many years to come! Thanks for stopping by! I'm Mona Lindvall. At mLindvall, I create one-of-a-kind and some-of-a-kind jewelry inspired by pieces of the past, by combining new and aged pieces and parts. My work is sometimes rustic, sometimes refined or a combination of both! Cowgirl Turquoise Sterling Silver Earrings. Vintage Western Charms Earrings. Wood and Sterling Silver Necklace. Connected Necklace. Folk Art Chain Links. Latitude and Longitude Sterling Silver Cuff Bracelet. Personalized Coordinates. 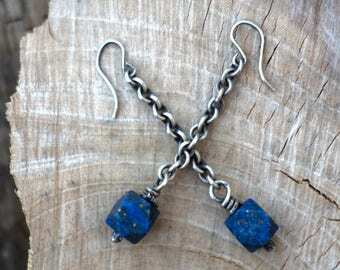 These will be earrings I wear on a regular basis for years to come. Fabulous! I wanted a red eye bead bracelet and Mona came up with this bracelet for me, awesome!! She is always so willing to work with you to find exactly what you want and is so talented!! I highly recommend this seller/shop. 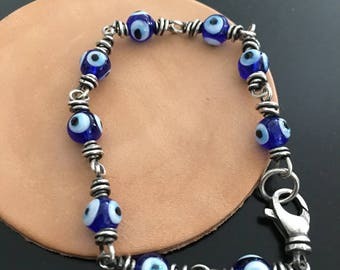 This bracelet is exactly what I was looking for. Beautifully made and sized to fit. I just ordered a second one. Excellent seller and speedy delivery :) thank you! If you ever have the opportunity to have a tintype photo taken, do! And lucky to have enough space in my living room to have a "studio table" to work from by night! My recent show display in the RAM gallery. Delighted with the way my new vintage felt pennant style banner turned out! Mona Lindvall has been creating one-of-a-kind and some-of-a-kind jewelry for nearly 15 years and describes her art as "jewelry inspired by pieces of the past.” A graphic designer by trade, Mona worked full time in the field of communications while raising her now-adult children. All the while, she collected vintage jewelry, studying the history of jewelry from many eras and learning about the healing and symbolic properties of designs, metals and semiprecious stones. She often “rescues” pieces and parts that she finds along the way, transforming them into jewelry with intention. Mona attaches meaning to most of her work, either obvious or hidden, sentimental or spiritual, or relating to a person, place or event. Born out of her love of well worn jewelry, Mona oxidizes all her silver to give it a warm patina. She’s honored when a piece of her jewelry resonates with the wearer! Thanks so much for stopping by mLindvall! I will accept returns within 7 days of your receipt of the item. Please contact me to let me know if you feel the need to return an item. I accept PayPal, money orders or personal checks for payment on an order. I ship my in stock items within 1 business day of receipt of payment. If you've placed a custom order, I will give you an approximate delivery date upon receipt of that order. I ship USPS First Class Mail or First Class International, unless otherwise requested. I will gladly adjust sizes, or make minor alterations, at no additional charge.